Home Blog Hurricanes, Wildfires, Floods: Marian Pilgrimage Finally Hits the Road Again! It’s time to hit the road again with Marian Pilgrimage: Discovering Mary Across the USA! I’m both excited and relieved to be heading out again. With Hurricanes Harvey, Irma, and Maria, plus the wildfires in Washington, Oregon, Idaho, Montana and now California, I’ve had to drastically rearrange my travel schedule. Some of the trips have had to be postponed until Spring – in particular, St. Mary’s Mission in Stevensville, Montana. When last I spoke to the shrine director, she tearfully told me, “Marge, I recommend that you cancel your trip for this fall. The fires are right across the highway from us. I don’t even know if we’ll still be here tomorrow.” She asked me to wait until the shrine opens again for the season on April 17, 2018. I ask you to please pray for all those affected by natural disasters. There are people yet in harm’s way and others who still suffer in the aftermath. From a Marian Pilgrimage perspective, some of our most beautiful, grace-filled and historic Marian sites may never be the same or even disappear completely. 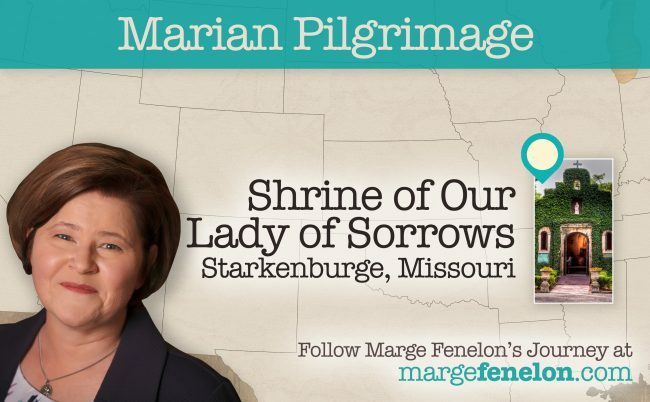 On the upside, I’m about to make a trip to Starkenberg, Missouri to experience the Shrine of Our Lady of Sorrows. Originating as the Parish of St. Martin, the first structure built on the property was a log chapel. That was in 1852. The current chapel – made of stone – was completed in 1910. Nearby is St. Martin’s Catholic Church, a fully functioning parish. The history of the Starkenberg Shrine includes stories of heroism and hard work on the part of German immigrants and surrounds a special statue of the Blessed Virgin Mary. Two miracles attributed to Our Lady’s intercession are recorded in the parish history. There are others spoken of anecdotally. There’s so much more to tell, and I’m looking forward to delving into the stories, atmosphere and grace of this shrine. I invite to you accompany me virtually as I journey. I’ve created a Facebook event and will live stream from the shrine. I’ll be posting about it on my Twitter, LinkedIn, Google+ and Instagram accounts and blogging about it at National Catholic Register as well as right here at MargeFenelon.com. If all works well, I’ll come to you live on Relevant Radio’s Morning Air Show, too. Please pray for me as I prepare and make the trip. Be assured that I’ll be praying for you. If you’d like to submit prayer intentions, please email them to marge@margefenelon.com. I’ll write them in my little notebook and place them before our Blessed Mother while I’m at the shrine. Lots of exciting stuff! I can’t wait to share with you what I see, feel, hear, and experience as I travel to the Shrine of Our Lady of Sorrows in Starkenberg, MO. Blessed Virgin Mary, Catholic Church, Marian Pilgrimage, United States. Bookmark.